Have you ever been so mesmerized by a speaker that you lose track of time? Historians consider Progressive Era politician Robert M. La Follette, one of the great 20th century orators. He frequently gave speeches allowing him to have constant contact with the citizens of Wisconsin. This lesson focuses on one of La Follette's "well-known" speeches, "The Danger Threatening Representative Government." When using this primary resource and the additional supporting materials, students will not only be able to learn more about the ideals of La Follette and the Progressive Era, but they will gain insights about great orators and understand the rhetorical roots of modern day politicians. It is difficult to study about the Progressive Era without seeing references to the model of progressive reform - Wisconsin. The state gained this reputation by initiating substantial legislative reforms and their subsequent promotion by forward-thinking leaders. Robert M. La Follette's charisma and drive, as governor, encouraged an environment open to change in the state and helped institute legislative reforms. After his election to the U.S. Senate, La Follette showcased Wisconsin as the shining example of progressive reforms and was never far removed home-state politics. 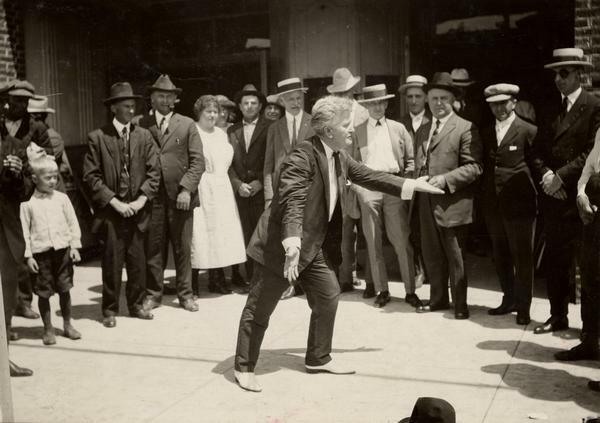 This collection of primary source materials will help your students explore La Follette's contribution to the Progressive Era. The document associated with this section is a speech delivered in Mineral Point on July 4, 1897, by Robert M. La Follette, marking a major shift in the politician's career. At age 41, La Follette had already served three terms in the U.S. House of Representatives and more recently had established a successful law practice in Madison. For nearly twenty years La Follette had considered himself a loyal member of the Republican Party. In 1896, seeking the nomination for governor, La Follette had learned that twenty GOP convention delegates had accepted bribes and defected to the machine's preferred candidate, Edward Schofield. In defeat, La Follette abandoned plans to defeat the Old Guard by winning delegates at local caucuses. He became an insurgent within the Republican Party, promoting the idea of the direct primary. La Follette launched the next campaign on July 4, 1897, almost a year and a half prior to the election. Standing in a wagon bed at county fairs, the dynamic orator outlined the crisis facing American democracy. As he campaigned, La Follette gradually began developing a set of solutions to eliminate corruption in government. When he failed to obtain the GOP's nomination in 1898, a bill that would have established the direct primary in Wisconsin died in the legislature. The full text of "The Danger Threatening Representative Government" is thirty-four typed pages. It is part of the Robert M. La Follette Papers, preserved in State Historical Society of Wisconsin Archives. La Follette underlined portions of the text for emphasis. Ask students to read the excerpt of La Follette's speech "The Danger Threatening Representative Government" and answer guided questions. Discuss responses out loud to ensure comprehension. Afterwards help students visualize the speech by having them analyze a series of La Follette photographs using the photo analysis sheet. Include an additional level of analysis and incorporate an additional historical skill into this activity by asking students to edit a historical document. The speech that students read is actually an excerpt of the original speech. Edited by a historian here at the State Historical Society, it highlights what he viewed as important. Print out copies of the original speech and ask students to decide whether they agree with his decisions. Then have students create a one-page edited version of the speech. Make sure the speech is coherent and readable yet still captures the significant points. Ask students to take on the role of a newspaper reporter covering this speech in 1897 and write an article relating the events of the day. You can also share with the class an example of how newspapers often covered La Follette's appearances and speeches. What problems does each speaker identify? What solutions does each propose? Why do you think each speaker thought these problems were important? Who were the audiences for each speech? How did the audience contribute to the nature of the speech given? What generalizations can you make about the Progressive Era from these two speeches? Do the problems La Follette and Black Kander identified still exist today? if so, in what form? Have students read the speech, and examine the photographs of La Follette. Remind students that the original speech was thirty-four typed pages in length. Ask students to consider how today's audience might react to this speech. In addition to common themes, such as those discovered by answering guided question 7, what changes in language, length, and delivery would today’s audience expect? After this discussion have students "rework" the speech in groups and present it to the class. La Follette encouraged the passage of the primary election law as a way to improve government through the involvement of citizens. Today many efforts aim to strengthen democracy through increased citizen participation. After students read La Follette's speech and answer the guided questions, have them examine the current Electoral College reform measures. Encourage discussion based on the origins, goals, and future of this measure. Barton, Albert O. La Follette's Winning of Wisconsin (1894-1904). Madison: The Homestead Company, 1922. Buenker, John D. and Edward R. Kantowicz. Historical Dictionary of the Progressive Era, 1890-1920. New York: Greenwood Press, 1988. Buenker, John D. The History of Wisconsin Volume IV. The Progressive Era, 1893-1914. Madison: The State Historical Society of Wisconsin, 1998. Buenker, John D. "Robert M. La Follette's Progressive Odyssey." Wisconsin Magazine of History. 1 (1998): 3-31. Clark, James I. Robert M. La Follette and Wisconsin Progressivism. Madison: The State Historical Society of Wisconsin, 1956. Heitzmann, William Ray. "Looking at Elections through the Cartoonist's Eye." Social Education. 5 (2000): 314-319. La Follette, Robert M. La Follette Autobiography. Madison: The University of Wisconsin Press, 1960. Margulies, Herbert. "Robert M. La Follette as Presidential Aspirant: The First Campaign, 1908." Wisconsin Magazine of History. 4 (1997): 258-279. Maxwell, Robert S. La Follette. Englewood Cliffs: Prentice-Hall, 1969. McCarthy, Charles. The Wisconsin Idea. Wisconsin Electronic Reader. (1998). Otto, Max C. "Washington, the '20's." Wisconsin Magazine of History. Winter (1959): 109-111. Risjord, Norman K. Wisconsin: The Story of the Badger State. Madison: Wisconsin Trails, 1995. "Robert Marion La Follette." Wisconsin Electronic Reader. (1998). Steffens, Lincoln. "Wisconsin: A State Where People Have Restored Representative Government - The Story of Governor La Follette." McClure's Magazine. 6 (1904): 563-579. Torelle, Ellen. The Political Philosophy of Robert M. La Follette - As Revealed in His Speeches. Madison: Robert M. La Follette Co., 1920. Weisberger, Bernard A. The La Follettes of Wisconsin: Love and Politics in Progressive America. Madison: The University of Wisconsin Press, 1994. B.12.8 Recall, select, and explain the significance of important people, their work and their ideas in the areas of political and intellectual leadership, inventions, discoveries, and the arts with in each major era of Wisconsin, U.S. and world history. C.12.8 Locate, organize, analyze and use information from various sources to understand an issue of public concern, take a position, and communicate the position. This lesson was developed by the Office of School Services for use in the secondary-level classroom. Please adapt to fit your students' needs.